The largest non-polar tidewater glacier in the world was one of the major highlights of our cruise adventure. How could I have forgotten something that has made it to my “Top Picks” list? Can I blame it on exhaustion from the holiday stress?? Yes my friends, Hubbard is one of the eight glaciers that is currently advancing instead of retreating, thickening instead of thinning. First mapped in 1895, the Hubbard’s huge open face is more than 5 miles wide and actively calves icebergs as large as 10-story buildings. Once in 1986 and then again in 2002, it has twice blocked the mouth of Russell Fjord making it a lake as high as 90 ft above sea level. 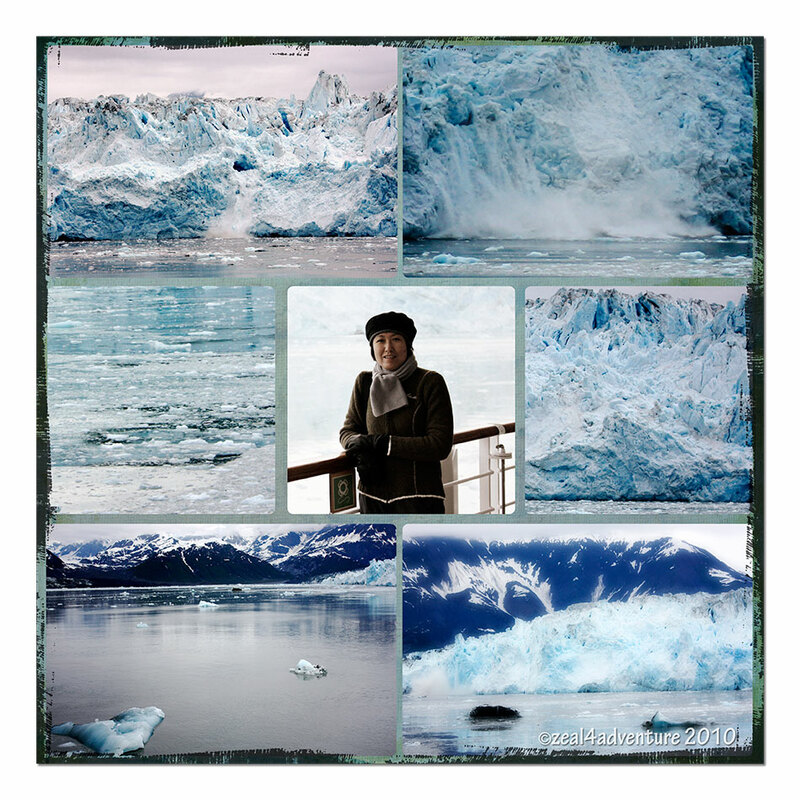 Beautiful scenery and photos from the Hubbard Glacier. I’m sure you will always remember your cruise to Alaska. I really did say “wow” out loud when i opened your blog. If you get a moment would love for you to stop by and say hi! Incredible photos! Your cruise must have been a very special trip. And isn’t it great to know that some of the glaciers are healthy! Good heavens!!! what a great experience – lovely mosaic! Great photos in your mosaic. We’ll be taking an Alaska cruise in August and I’m really looking forward to it, especially after looking over your post. Wow, what a wonderful sight to see…thanks for sharing…this must have been a great cruise!!! Beautiful!!! Isn’t it amazing how the ice looks blue? Amazing photos! Have a great weekend!